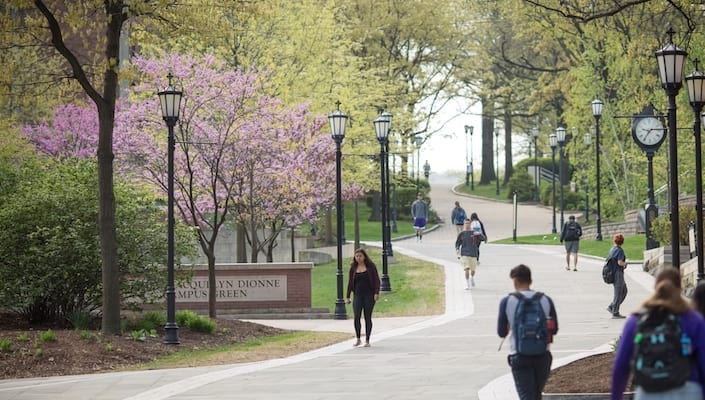 During the fall semester, the Schemel Forum’s World Affairs Luncheon Seminars at The University of Scranton will expose area residents to a wide range of subjects including art, history, literature, science, society and, of course, international affairs. Experts in their fields will share their unique insights and expand our region’s educational and cultural awareness. The series begins on Thursday, Sept. 17, with “Mark Rothko: Immigrant, Artist, Pioneer,” presented by Annie Cohen-Solal, Ph.D., cultural historian, writer and professor of American studies at the Universite de Caen, France. “Although Mark Rothko has undeniably reached the status of an iconic artist whose paintings sell for about $80 million, he remains mysterious,” said Dr. Cohen-Solal, who approaches him through the lens of her social history research and unveils many fascinating aspects of his life and character. “Rothko fought the narrow-mindedness of many U.S. institutions and was deeply committed to giving all publics genuine access to art,” she said. A book signing will follow the lecture, which will take place in the McDonnell Room of the DeNaples Center. On Friday, Oct. 9, Jennifer Hochschild, Ph.D., the Henry LaBarre Jayne Professor of Government and professor of African and African American studies at Harvard University, will present “Genomic Science, Politics and Race: Can They Coexist Comfortably?” As the uses of genomic science move into many arenas of life including medicine, law, racial identity, energy production, pest control and dating services, genomics can be expected to develop ideological and partisan valences. Dr. Hochschild asks, “Do we trust the American population to be sufficiently past biological racism (if they are white) or sufficiently strong to fight off biological racism (if they are black) so that we won’t revert to the old discredited eugenics or ‘racial science’”? Dr. Hochschild, who acknowledges that the issue has some gray areas, said, “Most of the time I think that the answer is yes, but things like continued support for the Confederate flag or portrayals of Obama as a monkey make me wonder. More analytically, survey data suggest that both blacks and whites have sensible, coherent, reasonably similar views on the relationships among genomics and race (e.g. whether there is a stronger propensity in one group toward genetic inheritance of certain traits or diseases). But academic experts on genomics in the field of race and ethnicity are almost uniformly opposed to anything that links biology and race, broadly defined. So the question remains open.” The seminar will take place in the Rose Room of Brennan Hall. On Wednesday, Oct. 21, Morey M. Myers, of Counsel, Myers, Brier & Kelly, LLP, in Scranton, will present “Who was the Greater American, George Washington or Abraham Lincoln?” Washington and Lincoln are considered to be our greatest presidents. “If you agree,” asks Myers, “which do you think was the greater? Does greatness in our leaders require a national crisis? What were the challenges that Washington and Lincoln confronted prior to and during their presidencies? Can you compare a president of a fledgling nation in the 18th century with one attempting to preserve a greatly expanded one in the 19th century?” Myers intends to examine their respective strengths and weaknesses to arrive at a decision and welcomes the opinions of his audience. The seminar will take place in the Rose Room of Brennan Hall. Trudy Rubin, Worldview columnist for The Philadelphia Inquirer, will present “Why Not Just Forget About the Middle East?” on Thursday, Nov. 5. “That’s the temptation, as U.S. oil production soars and the region collapses,” said Rubin, who recently travelled to Iraq and Jordan and has covered the area for decades. She will explain why a more coherent U.S. policy is still essential if ISIS is to be defeated, Iran contained and chaos prevented from spreading beyond the Arab world. “At a time when campaign rhetoric, an oil glut and the public’s fatigue have convinced many Americans that the best policy is to withdraw from the Middle East, I will detail why the region won’t let us alone,” said Rubin, whose perceptive and persuasive editorial about the Iran nuclear pact appeared in The Times-Tribune on July 28. Sondra Myers, director of the Schemel Forum, added, “Trudy Rubin knows the Middle East like the back of her hand – not just its geopolitics but also the people in leadership. Her catchy title whets our appetites for an insider’s view of why we must pay attention to that always-troubled region.” The seminar will take place in the Rose Room of Brennan Hall. On Thursday, Nov. 12, Rosalind Williams, Ph.D., Bern Dibner professor of the history of science and technology at MIT, will present “History at the End of the World.” In modern times the goal of history has been to increase knowledge and power so that humans dominate the planet. Toward the end of the 19th century, the closing of the world frontier was taken as evidence that this goal would soon be achieved. Some exceptionally insightful writers of the time (Jules Verne, William Morris and Robert Louis Stevenson) believed this historical condition would bring a rolling apocalypse of loss along with what is usually called progress. Dr. Williams will help us decide if they were right. The seminar will take place in the Rose Room of Brennan Hall. By the close of the 13th century a Christian re-conquest, fueled by religious zeal and superior military power, had occupied Muslim Toledo, conquered the Cordoban caliphate and overwhelmed the caliphate’s successor city-states. Even so, an “Indian Summer” of Christian, Muslim and Jewish philosophical, literary and scientific collaboration persisted long after the fall of Toledo in 1085. As Muslim Europe appeared to vanish, Christian Europe experienced a Renaissance and an Age of Discovery underpinned by the philosophical commentaries and navigational advances derived from Islamized Iberia. The lecture will take place in the Rose Room of Brennan Hall. The World Affairs Luncheon Seminar series is sponsored by Munley Law. All Luncheon Seminars run from noon to 1:30 p.m. Participants can register to attend one luncheon for $20 per person or $30 per couple or for the entire series of six luncheons for $110 per person or $160 per couple. Schemel Forum members attend free. To register, contact Emily Brees, Schemel Forum assistant, at 570-941-6206 or emily.brees @scranton.edu. For more information on Schemel Forum programs and memberships, contact Sondra Myers at 570-941-4089 or sondra.myers@scranton.edu. The Schemel Forum is a program of participatory learning experiences aimed at cultivating the intellect and the imagination through study and discussion of classical texts and current policies, from the arts, history and philosophy to technology and theology. Founded in 2006 through generous gifts to the Rev. George Schemel, S.J., Fund, created by friends of the late Father Schemel in his loving memory, and spearheaded by Harmar Brereton, M.D, the forum has grown from a handful of informal lectures to a comprehensive enrichment program of study, dialogue, performances and special events. Through the forum the University offers to the community its most valuable assets – its faculty members and the wealth of knowledge that they possess.